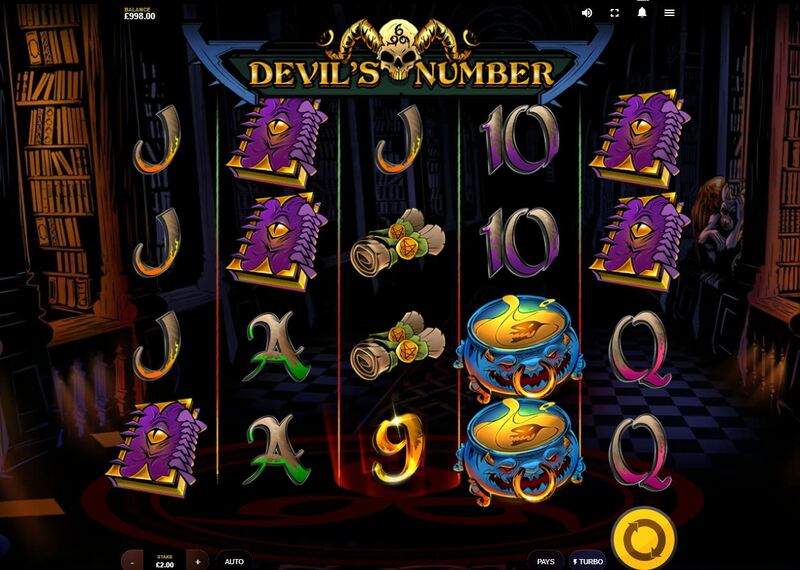 Devil's Number slot by Red Tiger demo play this metal theme! 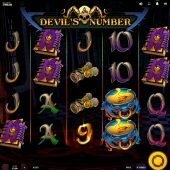 Devil's Number slot by Red Tiger is a pretty awesome slot in spite of the rather dark theme concerning the number of the beast and hints of Satanism on the reels. The music is correspondingly of a dark metal genre but you won't see Iron Maiden or Ozzy Osbourne here as we have a generic theme, as with Play'n Go's House of Doom although Leander's Megadeth and Netent's Motorhead will deliver some popular metal music if that's your thing. The reels lie over a spooky night time library which is somehow slightly out of synch with the modern symbols, but will this devil end up doing a number on our bankroll? There are 30 fixed lines over 5 reels of 4 rows each on Devil's Number and symbols appear stacked bar the scatters. The 5-of-a-kind pays are 12 or 22x for the Skulls, 6 or 12x Cauldron, 5 or 10x Book and 4 or 8x for the Scrolls. If you're puzzled as to why there are two values, read on! There are 5 card values for the lower pays and these offer 2 down to 1x bet for a full line. Inverted 6 scatters appear on the middle 3 reels and there are no Wilds. After any spin paying a card value win the Skull on the right of the grid may activate and remove the winning symbols and cascade replacements down from above. After a picture symbol win the Skull may activate and upgrade the win, hence the 2 different 5-of-a-kind values mentioned above. If you see 3 Gold 9 symbols on the centre reels these will turn upside down to reveal 666 and you get 12 free games. Sometimes the centre reels darken when the scatters are going to drop in, so look out for that too. During the free games any card value win will remove that symbol from the reels and cascade replacements down from above for that spin. Any picture symbol win will upgrade to its higher value as above. You cannot retrigger but get 6 extra spins for 3 scatters and if you remove the card values from the reels early on, with the pay upgrades the picture symbols can rack up some great totals here.